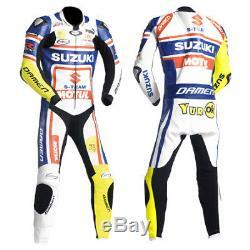 Motorcycle Racing Leather Jacket / Suits / Trousers with CE Certified Protections. 1.2 to 1.3 mm Thickness. Polyester Mesh Lining with removable protector pockets. Original YKK zippers for durability. High Quality CE Certified Protectors in elbows, shoulders and back. High quality stretch fabric between under arms for comfort and maximise mobility. We are expert in Embroidery, Laser Printing and Stitching of Logos, Names, Patches, Labels and Lettering from past few decades. We also provide options for custom made designs, fabrications, perforated leather, protection and colors of your choice. Please make sure that you take your exact body measurements and do not leave extra inches loose (not to take too tight measurements also) as we will add extra inches ourselves if needed to maintain the suit shape in order to achieve an outstanding fitting, comfort , flexibility and being able to wear any under garments or other clothing. 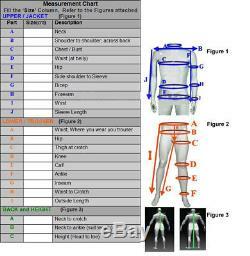 We also suggest you to take the measurements of the naked body or of slim clothes to get accurate measurements. NOTE: Measurement form is attached along with the above pictures of the Suit / Jacket and Trouser. You are kindly requested to fill the form according to the requirements for instance, if you are ordering a Jacket, only send the measurements related to it. We are manufacturing leather products since 1989, our offshore manufacturing facilities are equipped with latest machinery and experienced fabricators. Our Design team is committed to provide latest and innovative products as per latest trends and customer's demand. The item "Suzuki Motorcycle Leather Suit Motorbike Leather Suit Men Racing Leather Jacket" is in sale since Tuesday, March 06, 2018.